We met Heidi & Jonnathan on a beautiful summer evening for their engagement photos at their wedding venue, Postlewait’s Farm. 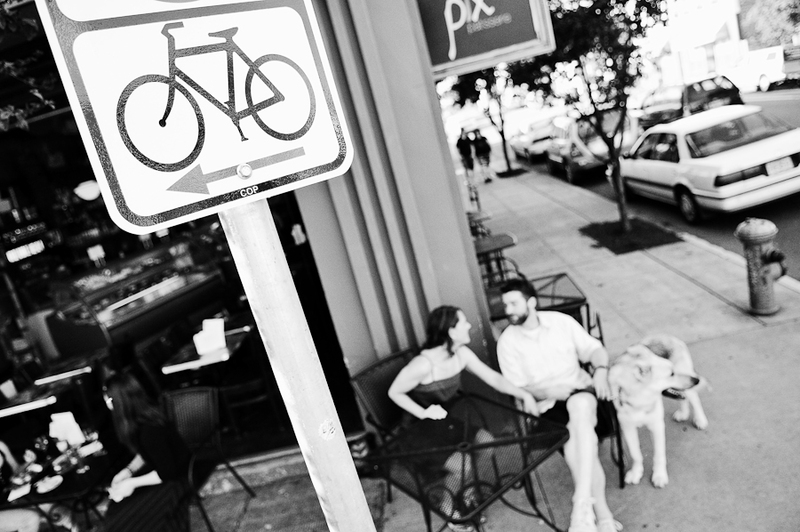 Couples usually choose a different location for their engagement photos, but Postlewait’s was a great choice! We love the relaxed, summery feel this working farm brings to the images. Heidi and Jonnathan also seemed to enjoy it quite a bit as well! 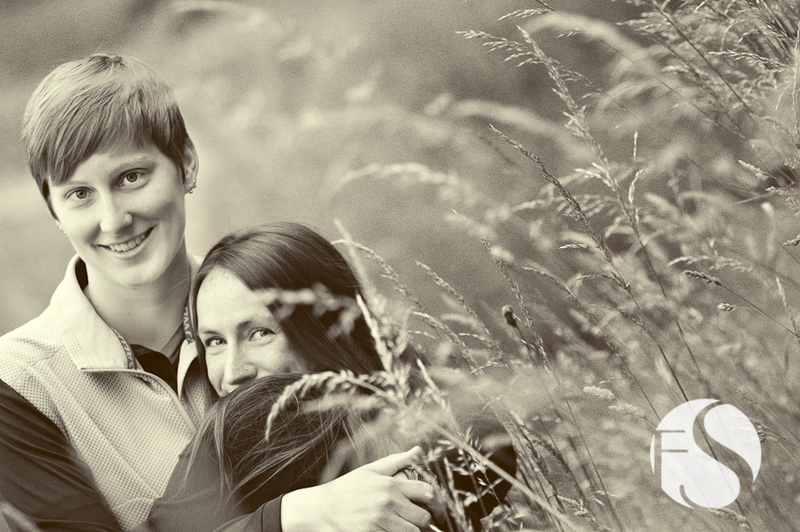 There’s a whole lot more photo-goodness to be had here and we are really looking forward to their wedding next week! 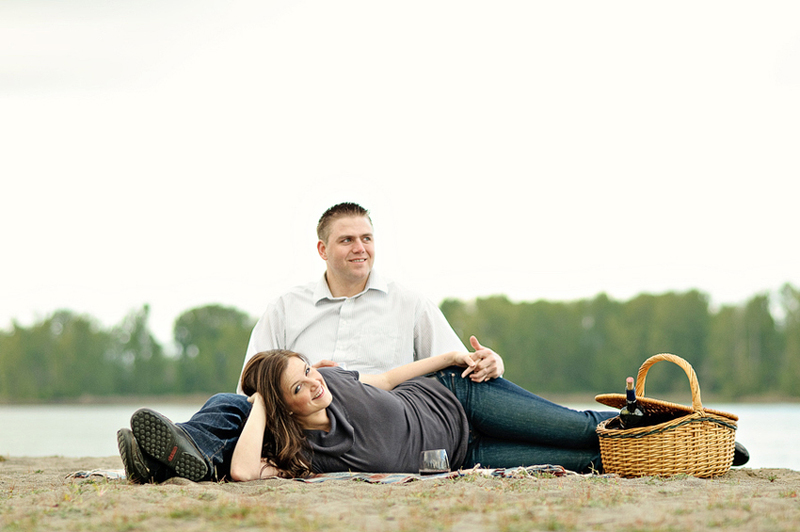 Our shoot with Leigh & Ron will forever be known as the engagement session of epic proportions! 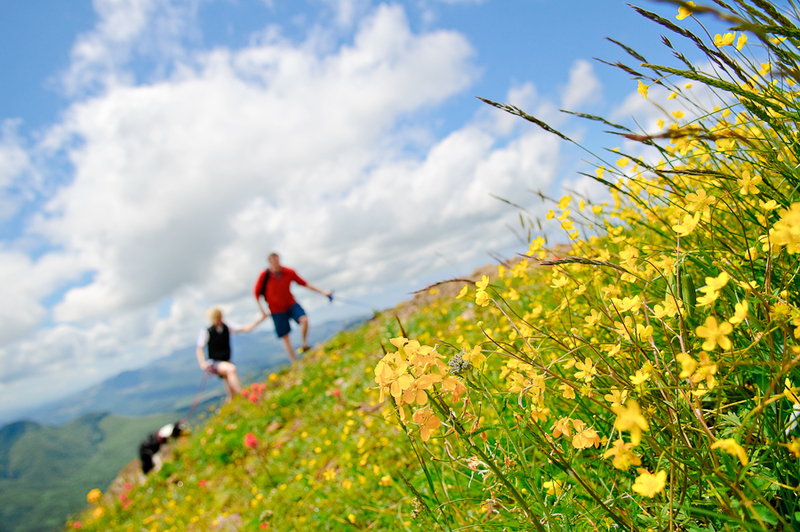 We started out with a hike up Saddle Mountain with their Border Collies for a commanding view of the North Oregon Coast & the mouth of the Columbia River. 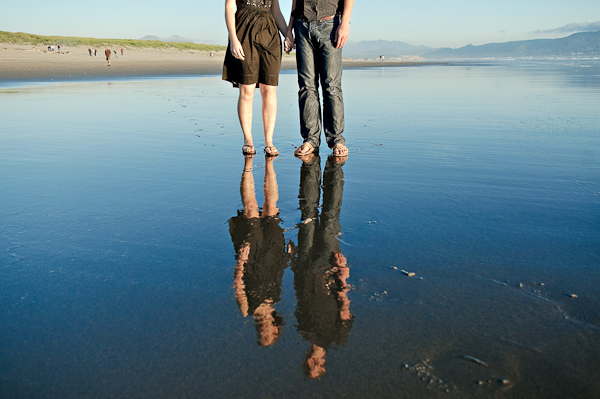 After resting-up with great food and beer in Astoria, we finished off the day with a sunset shoot on the beach. It was definitely a full and wonderful day! A big thanks to the both of you for sharing some of your special spots with us–we are looking forward to an epic wedding as well! Margi and Scott are dear friends of ours who are tying the knot in a few weeks! These two have been in front of my lens on many ski trips and forays into the backcountry, but this was a new adventure for us and equally as fun. We all met up, including their dog Quinn, on a recent evening for a few photos around their neighborhood near North Williams Avenue. The evening was beautiful, and after drinks at Pix Patisserie (the site of their first “official” date) we strolled the neighborhood shooting around all the great buildings. 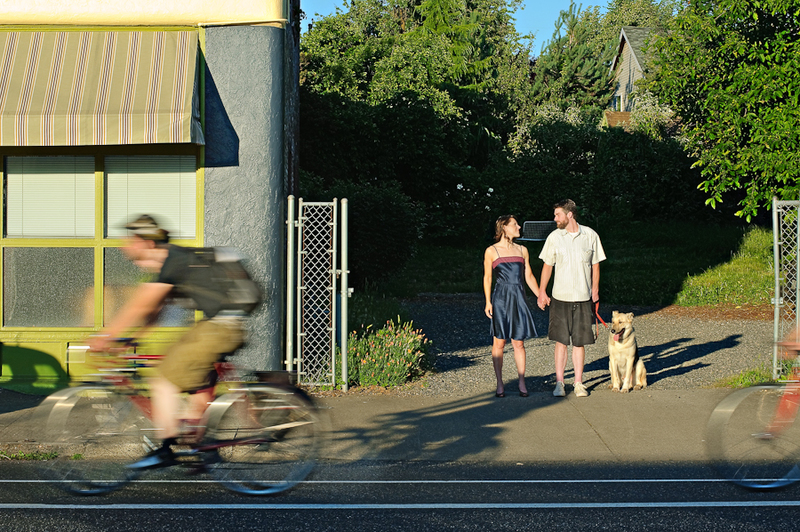 We wrapped up with a sunset bike ride near Portland’s Overlook Park, so stay tuned for more! It’s time for yet another blissful beach shoot! We met Andy & Danylle at the quaint and lovely town of Gearhart on a recent gorgeous Saturday evening to avoid the crowds everywhere else. 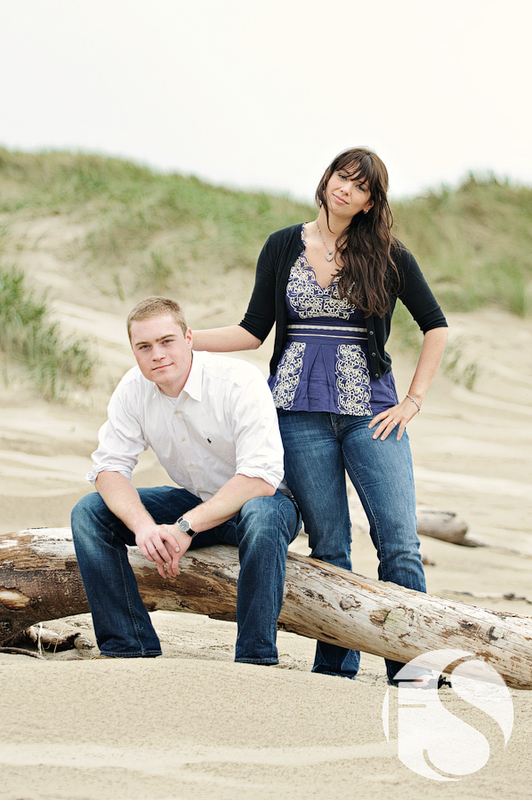 They are two energetic, dynamic & loving individuals that make one amazing couple! We has such a great time soaking up the last few hours of sunlight with them on this stretch of beach. 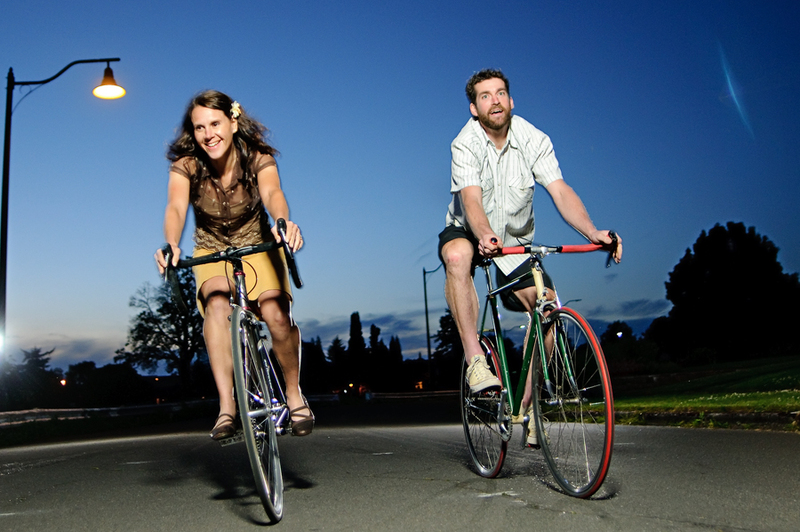 To say we are excited does not adequately describe how much we are looking forward to their wedding celebration this summer, but these two words will give you a hint: Bike Parade! 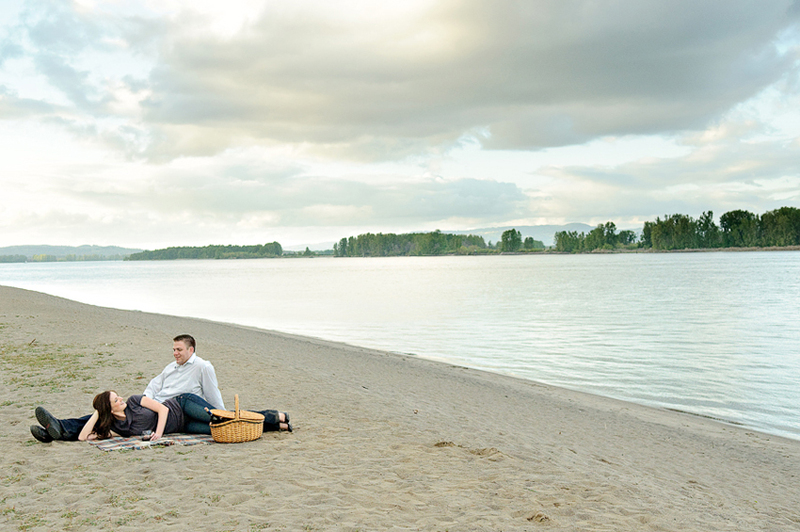 It doesn’t get much better than a spring evening on Sauvie Island outside of Portland! We often will head out to Sauvie’s at this time of year for an impromptu picnic, a quick hike, or just to catch the sunset. It’s a gorgeous escape from the city just outside the door! Erin and Joe thought it would make a great location for their engagement session, since her grandparents lived there during her childhood. We had an awesome time walking along the beach, watching the sunset over the green fields, and enjoying some wine with this fun couple. Erin & Joe, thank you for a great evening. We are looking forward to your wedding next month! You know a couple is special when they are willing to drive 4+ hours to the coast for a 2 hour shoot, and their smiles look as genuine and fresh as if they were in their own backyard! After meeting with Anna a few months ago and hearing her describe her love of natural colors and textures we decided the Oregon Coast would be a perfect location for their engagement shoot. When we originally planned the shoot, they were going to fit it into a longer road-trip. However, it turned out meeting for the shoot a little earlier worked better for their schedules so they decided to use the there-and-back drive (about 8 hours) as a good excuse for some quality time together. They obviously enjoy each other’s company, as their positive energy and love for each other really shined through during the shoot! The dunes and beach-grass near Manzanita were a perfect backdrop, and despite the intermittent rain showers Anna & Billy truly embraced the moment. 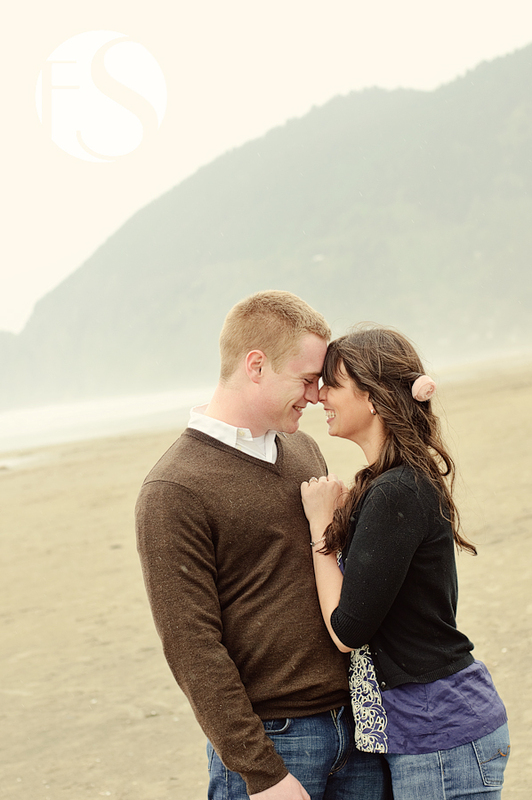 We are excited to spend more time with them and photograph their waterfront wedding on Puget Sound this summer! If you have followed our blog recently, you know this month has been a big one for us with the birth of our son, Leland! That being said, it has also been pretty quiet on the photography front (aside from taking a ton of photos of the little man). Since Leland was due in the middle of October, we made sure our schedules were relatively clear so we could spend as much time with him as possible and get accustomed to being new parents. The beautiful light and rampant color of Fall is such a spectacular setting for portraits that it has been strange to not get out and take advantage of the season as much as years past. 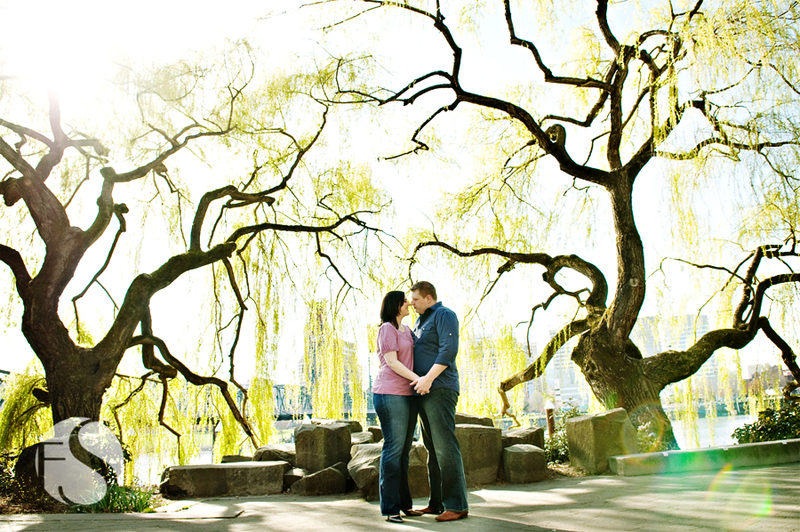 Luckily, I was able to meet up with Ashley and Elliott in downtown Portland for an afternoon engagement session amidst the trees of the South Park Blocks and on the waterfront at the Riverplace Marina. These two know how to have fun together, and definitely make each other smile! Although, Ashely did give a few “seriously? !” looks towards Elliott after one of his many quick-witted wise-cracks. Just keeping him on his toes! After being dubbed “Papa Bear” by Elliott, which I proudly accepted, we shot in the Park Blocks around PSU and then took the Streetcar down to the waterfront just in time for sunset. 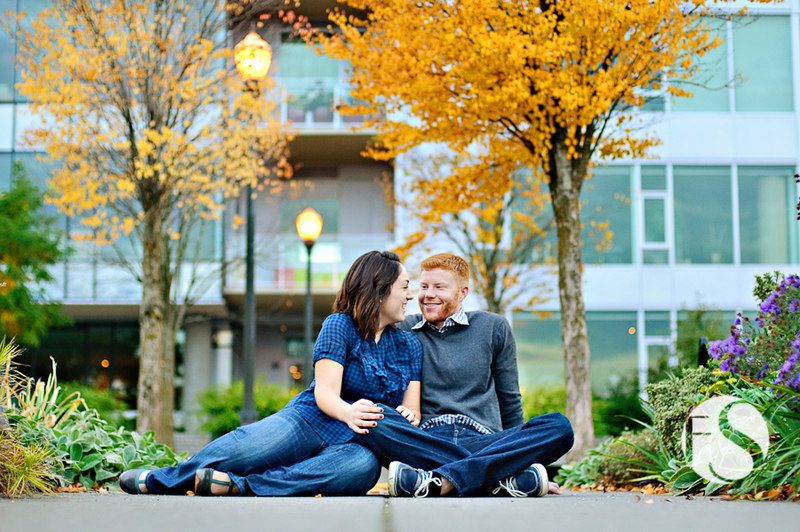 Thanks for a fun shoot you two, we are looking forward your wedding in January! In the meantime, I will do my best to live up to my new Papa Bear status. We recently met up with Olivia & Bethany at Mt. Tabor Park on a not-so-sunny-yet-still-beautiful day for their engagement shoot. After hiking up to the top of the park (shooting along the way, of course) for a view of downtown Portland from the spot where Bethany took Olivia by surprise with her proposal, they were kind enough to climb up into a huge old oak tree at my request. Thanks you two, we are looking forward to your wedding in July!